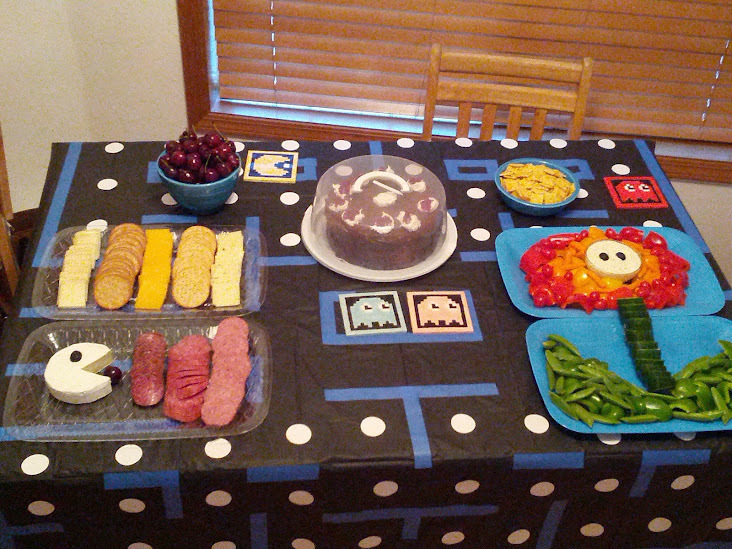 Last weekend, Caleb had his big video game themed birthday bash. It was so much fun! 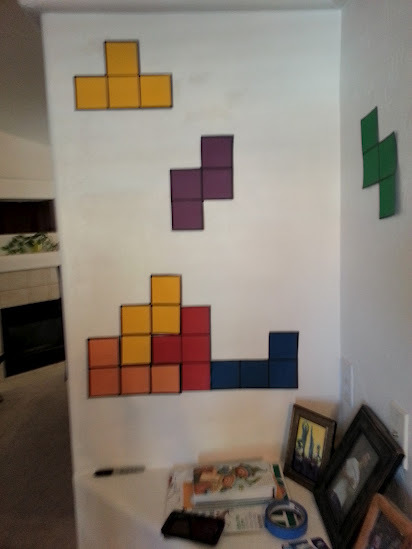 His friend Tami put together some amazing decorations and a very cute snackies layout that went on to be completely demolished by Om-Nommy gamers. Side note: if you are a gamer or someone who, like me, likes to watch other people play games, you can check out Caleb and Tami and lots of friends play games streaming online at GamersNorthwest.com - they have a Resident Evil marathon coming up in October! 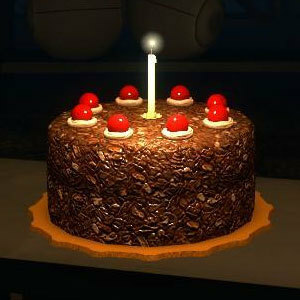 The cake in the game looks like a version of Black Forest Cake, a very rich German cherry-chocolate creamy cake that gets its name from the cherry liquor made in the Black Forest Mountain Range. I like to think it's also one of the desserts the Black Forest witch uses to lure Hansel and Gretel into her cottage in the fairy tale, but that's just me. Now, I'm not particularly gifted when it comes to baking cakes. Cookies I can do no problem, but my cakes from scratch rarely ever turn out very palatable - they always come out too dry or, even grosser, not actually baked. I don't know the source of my inabilities, but I also don't really care: there are so many ways to get around having to bake a real cake from scratch, it's not a problem, buddy. I use lots of short cuts when I bake cakes, my favorite being mixing in weird foods with cake box mixes for a "healthier cake" (although, really, if I'm going to eat cake I just commit to the cellulite... I earned it). Hungry Girl has a great resource about what kinds of healthy substitutes to use for eggs and oil to make cake mixes a little less fatty, and it includes a lot of information about what things work best with different cake flavors and how the cake turns out. For Caleb's No Lie Portal Cake, I went with the super moist devil's food cake and plain non-fat Greek yogurt combo, with a few added ingredients to make it more Black Forest-y. It was moist and fudgey-cakey and so rich, I could only handle a couple of bites myself. My recipe makes two layers, per the Portal version of the cake, and is lacking the chocolatey shavings on the sides because I... ahem... ran out of time. It was plenty chocolately, though, so that might have been overkill anyway. Baking: Preheat oven to 350º F or to whatever the box cake mix instructs. In a large bowl, combine both boxes of cake mix, all yogurt, all water, and .5 cups cherry preserves. Mix with a mixer on medium until smooth. Lightly grease and flour the bottom and sides of two equally sized round cake pans and divide the batter equally between them*. Bake for 20 - 30 minutes, or until a knife piercing the middle of each cake comes out clean. * So I only have one spring loaded round pan that is the size I wanted my cake to be, so I mixed each of the box mixes with 1 cup of yougrt, 1.25 cups of water, and .25 cups of cherry separately, and baked each layer separately, which meant a long night of baking, to be honest. You can mix all of the ingredients and bake the layers at the same time like in the instructions, but the baking time could take longer. Each of my layers separately were done after 22 minutes. After baking, allow the cakes to cool in the pan for at least 5 minutes (until the pan is cool enough to handle). Remove the cakes to a cooling rack until completely cool before crumb coating. I made my cakes the night before the party, so I crumb coated both cakes with chocolate frosting (put a very thin layer of frosting all around the cakes) and separately wrapped them tightly in plastic cling wrap and placed them in the fridge. Frosting and assembling: When you are ready to assemble and frost (I did mine about 1/2 hour before the party), move the layer you wish to be the bottom to your cake plate. Remove the plastic wrap. Mix together about .25 cups cherry preserves and .25 cups whipped cream frosting in a small bowl. Spread the preserves/ frosting mixture over the top of the bottom layer, leaving about 1/2 inch of cake border around the edges. Make sure the misture is spread evenly so your cake won't look lopsided. 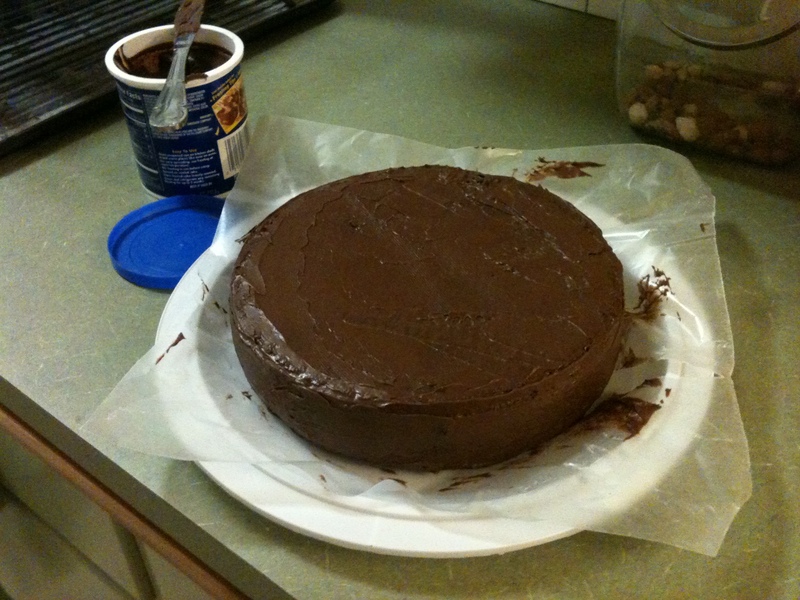 Next, carefully lay the top layer over the frosting mixture on the bottom layer. For me, this was achieved by putting my huge and very clean hand on the top of the top layer cake and flipping it over out of its plate onto my hand and then gently placing it on the bottom layer. I was very chocolatey at the end of this activity. Frost all sides of the cake with chocolate frosting. You can get creative with your spatula/ knife and make texture in the frosting if you don't layer on chocolate shavings. With a small spoon, drop about a teaspoon of whipped cream frosting all along edges of the top. Drop a maraschino cherry into each whipped cream drop, or do what I did and spoon a tiny dallop of cherry preserves onto each. Put on big drop of whipped cream frosting in the middle of the top layer and put one birthday candle in it. Makes 24 thin but tall servings Then eat it while jumping through Portals or watching the Gamers Northwest shoot zombies on Twitch. Glad to read the cake and frosting fondant recipe. Will try doing it for my daughter's birthday party next week. One of the best Venues in NYC is already booked by my husband. Will invite all our family friends and relatives along with little kids. Hoping to have a enjoyable day with all. 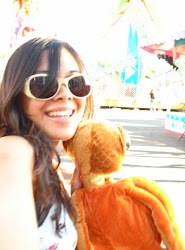 Searching for entertaining game ideas too.